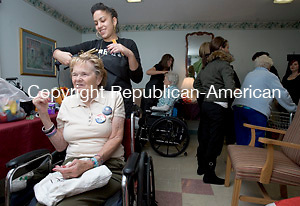 TORRINGTON, CT 22 October 2008-102208SV01--Jennifer Horvath of Torrington works on Norma Rideout's hair at Marathon Health Care Center in Torrington Wednesday. Students from Brio School of Cosmetology were at the center cutting and styling hair, giving manicures, massages and makeup. It was an opportunity for the students to gain experience with the older population and the residents loved the attention.